Here's a couple miniature winter scenes I created a couple years ago. I still enjoy them, so I thought I'd share the simple ideas with you. 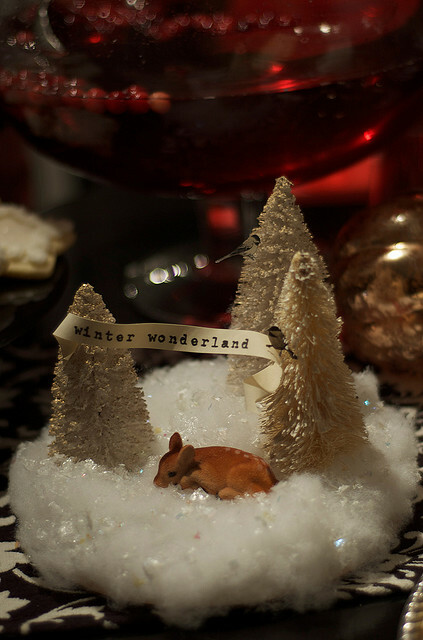 This DIY miniature winter scene is sure to delight! It serves as a placecard, and doubles as a favor when you tuck a sweet Christmas treat inside. 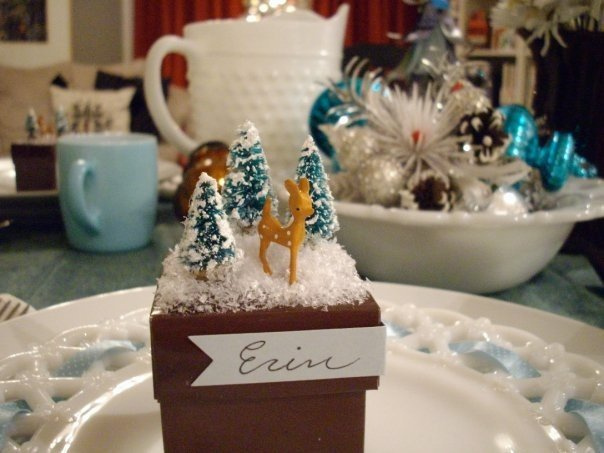 Materials: Miniature trees and deer, artificial snow (these three items came from local five and dime), favor box (party supply store), ribbon style paper tag (Martha Stewart, or cut out yourself). Instructions: Attach trees to box top with hot glue. Attach snow to surrounding box top with spray fixative. Attach deer with hot glue. Fold tag in half, attach to sides of box top with white glue or hot glue. Place Christmas candy inside box. Let the guests enjoy! This project was featured on design*sponge, and won me some cool prizes in a holdiay entertaining contest! This adorable winter scene serves as a delightful centerpiece or a pleasing accent to any holiday display. Materials: cardboard cake round, miniature artificial trees, artificial snow, small woodland animal toy, printed phrase and birds (cut out of a magazine our print out online), hot glue. Instructions: Attach trees to cardboard with hot glue, attach artificial snow to surround cardboard, nestle animal(s) into snow, attach with hot glue. Cut out printed birds and phrase, attach with hot glue. I think you know how much I LOVE these! Still have my sweet ornament! :) Hanging proudly! Have a wonderful holiday, Erin! Yay! Thanks, Uncle Beefy! Always good to hear from you. Hope you have a very merry Chistmas!